What's blue in colour, rugged, domed shape with side flaps and gives you instant 125SPF protection from the sun, rain and wind? A SKLZ Sport-Brella of course! 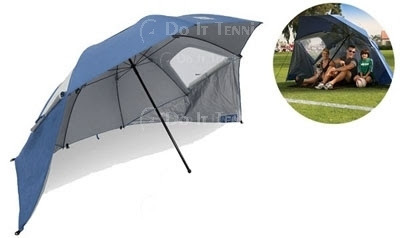 Apparently, this Sports Sunshade Umbrella is so popular that it has been back-ordered until July 15th! So if you order one today, your sport-brella will only ship out then. The sport-brella sure looks huge to me but don't let its size fool you for this gigantic umbrella is very easy to set up. It takes a mere three seconds to have it up and it is big enough to fit your entire family. This would be a great item to bring along when you're enjoying a picnic or watching your kids play at the park and of course when you visit the beach. It almost looks like a small cosy tent doesn't it? I used to carry an umbrella around everywhere I went, especially during my working days. I was in the sales department then, which required a lot of travelling. My umbrella was nothing as huge as the sport-brella of course but I always had one with me. I guess it's because I've always been afraid of the sun and its harmful effect on my skin. I pride myself with having good skin and complexion and since I'm not getting any younger, I'm glad that I started caring for my skin at an early age. Nowadays, the umbrella is gone. I no longer have to meet clients and travel in the hot sun, so an umbrella is no longer necessary. I do however still require my shades every time I leave home. Without them, I'd feel incomplete and my eyes unprotected from the harmful effects of the hot blinding sun. Speaking of which, it looks like another hot sunny Friday here. And I'm glad I'm comfortably indoors with the air-con on at full blast instead of travelling the city to meet clients under the hot scorching sun. Have a great weekend everybody! Hugs sweetie! Thanks for chopping! Rizal FC2! :) Hat-trick to da max LOL! Janji hattrick Rizal woo hoo! This month u byk chop yay! Payung tu nampak memang sesuai kalau nak bawak berkelah. Kalau pasang nampak selsa "Cozy". Tambah sket alas, tambah bantal, tambah wanita cun, me baring imagine depa suapkan anggur. Oh lalala. Bagai old time Kings dulu2. hoho. Lagi satu, payung tu kalau pasang, macam ada privasi sket kalau kat open beach ke apa. Kira dah wujudkan barrier - my family private space. Nampak memang mobil sebab tak banyak bahagian-bahagian bila nak pasang. Ohh yeah... badabing DE BOMB!!! 3x. no.2 whoaho!! marzie, have a great weekend..
ok, gtg, friends dah tunggu kat kereta nak pergi s. jumaat. I oso byk nyamuk nowadays TH, I have one big ridsect on my desk now! Thanks sweetie, you enjoy yours too! I have so many umbrellas around the house but whenever I need one, sure I won’t be able to find it Ayie ha ha!